August 10, 2013, VICTORIA, BC (ISN) – The University of Victoria Vikes men’s and women’s track program will be well represented at this year’s Canada Summer Games, hosted Aug. 2-17 in Sherbrooke, Que. Preliminary qualifications will begin on Monday, Aug. 12, while the final events will wrap up on Aug. 16. Nine current Vikes will be competing for their respective provinces, while incoming recruit Ben Weir will also be in attendance. Headlining the group is 21-year-old Adam Gaudes, who enters his second Canada Summer Games and is top-ranked for the men’s 800-m event. Gaudes’ personal best in the 800-m is 1:48.76 and will be representing New Brunswick. For the women, Alberta standout Rachel Francois will compete in both the 800-m and the 4×400-m relay and has also previously competed in the 2009 Canada Games and the 2012 Western Canada Games. Francois is the two-time defending champion in the 800-m in Canadian Interuniversity Sport and in the same event ranked third in the NACAC Championships and sixth at the Canadian Olympic trials. Also competing in the 800-m event are Cole Peterson, Thomas Riva, Grace Annear and Kendra Pomfret. Peterson, also Alberta’s athletics team captain, will join Riva in the 1500-m event. Rounding out the cast is soon-to-be Vike Weir, competing in the 5000-m, Patrick Psotka, Ryan Cassidy and Brendon Restall. LANGLEY ADVANCE – JUNE 13, 2013 – Trinity Western University track athlete Chris Voth had the race of his life in the 5000m to lead the Spartans at the Coquitlam Cheetahs Annual Jesse Bent Memorial Meet. The Abbotsford native finished first with a time of 14: 46.10 at Coquitlam’s Percy Perry Stadium on Sunday. Voth led a Spartans contingent that was competing in its third meet in the Lower Mainland in just over a week as part of an effort to push for an outdoor aspect to the Canada West and CIS competition schedule. The University of Alberta and the University of Victoria also competed in this week’s three-event series. This past weekend’s meet was also the Canada Games trials for Team B.C. It’s expected the team will officially be announced sometime this week. While there were plenty of quality performances from current Spartans, it was future Spartan Regan Yee who made waves by winning the 2000m steeplechase, and beating the Spartans’ Fiona Benson with a time of 7: 00.20. Benson finished second in 7: 01.91. Also of note was the performance of Canadian Paralympian Dustin Walsh, who broke the T11 Canadian 400m record with a time of 53 seconds. Walsh, who was also the previous record-holder, bettered his old mark of 53.05. Spartans track athlete and Langley resident Dylan Williamson is Walsh’s guide runner. 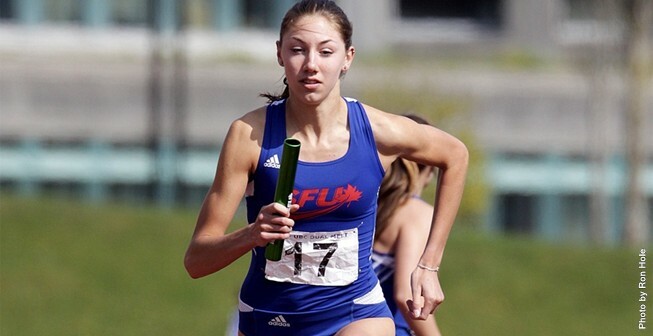 Portland, OR – Simon Fraser University track and field athlete Helen Crofts (West Vancouver, BC) has been voted the 2012-13 Great Northwest Athletic Conference Female Scholar-Athlete of the Year. Crofts along with male winner David Downs of Seattle Pacific, will now be a candidate for the 2013 Conference Commissioners Scholar-Athlete of the Year award, which will be selected this summer. Crofts received seven of 10 first-place votes in the balloting by the conference’s athletic directors. The award comes a week after Crofts was named the GNAC Co-Female Athlete of the Year. She had an impressive career not only on the track, but also in the classroom at Simon Fraser, compiling a near-perfect 4.14 grade point average. A biological science major with a concentration in Cells, Molecules and Physiology, Crofts compiled the highest grade point average among Clan athletes in 2012-13, earning the Bill DeVries Award for excellence in academics and athletics. She accomplished all that academically while also winning two national titles and four All-American awards during the 2013 NCAA Indoor and Outdoor national championships. Portland, OR – Simon Fraser University track athlete Helen Crofts (West Vancouver, BC) has been named the Great Northwest Athletic Conference’s Female Co-Athlete of the Year along with Seattle Pacific’s Ali Worthen. The award is voted on by the conference’s 10 athletic directors, who rank their top three choices for the award. Crofts and Worthen each received 18 ballot points in the voting process. Crofts won two national titles and earned four All-American awards in the 2013 NCAA indoor and outdoor national championships. At the indoor meet in March in Birmingham, AL, she won the 800-metre in a meet-record time of 2:05.96 and also led SFU to a third-place finish in the distance medley relay (11:37.62) and an eighth-place finish in the 4×400 relay (3:47.14). She completed a sweep of the 800-metre titles at the outdoor meet in May at Pueblo, CO, finishing first in a time of 2:08.18. A week prior to the outdoor national meet, she finished ninth in the USA Track & Field High Performance Distance Classic at Occidental. Her time of 2:02.10 was not only a GNAC record but also was the third fastest time by a collegiate athlete this spring at all levels. Mihailho Stefanovic and Raquel Tjernagel of New Westminster were big winners at the B.C. 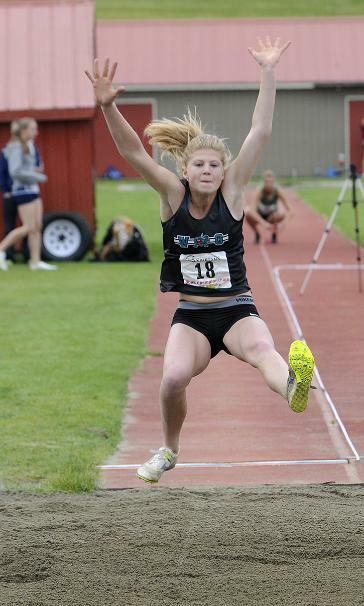 high school track and field championships held in Langley last week. 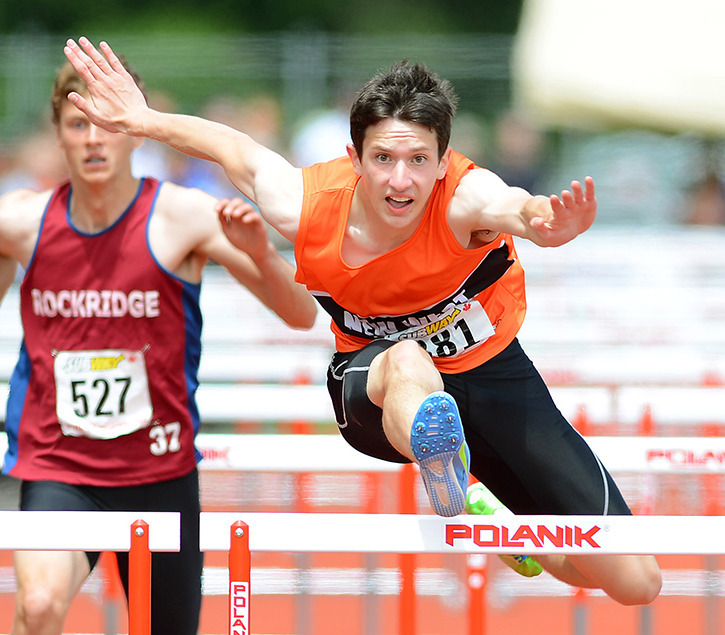 Stefanovic beat out Hyack teammate Bogdan Pavel to win the boys 110-metre hurdles. He crossed the finish line in 14.99 seconds, two-tenths of a second faster than Paval. Tjernagel captured the girls 200-metre final in 24.30 seconds beating out Zion Corrales-Nelson of Burnaby’s St. Thomas More Collegiate. In the 400 metres, the results were reversed with Corrales-Nelson winning in 54.94 and Tjernagel finishing in 55.45. New West’s boys 4×100 metre relay team came second in 44.32, finishing behind STM (43.23). Stefanovic and Pavel were joined on the team by Ethan Strome and Simon Rokeby. The St. Thomas More Knights came close to knocking off the perennial provincial powerhouse for the overall title at the B.C. high school track and field championships in Langley last week. STM came second finishing with 82 points losing out to the Victoria school by 11 points. The Knights, however, did claim the boys title with 46 points, five more than Oak Bay. More’s boys relay teams dominated. The 4×100 squad ran around the McLeod Athletic Park track in 43.23 seconds finishing ahead of New Westminster (44.32). In the 4×400 final, STM racked up a winning time of 3:25.83. Robyn Buckingham added a pair of bronze medals over the weekend, to go along with a silver she won the week before, to wrap up a strong showing at the B.C. high school track and field championships. The 15-year-old Grade 10 student at Walnut Grove already had a silver in the heptathlon from the multi-event championships held in Abbotsford on May 24 and 25. She then added a bronze in the high jump and helped the Gators place third — along with Keara Graham, Dallas Tilley and Megan Notting — in the 4×400 relay. Buckingham also had a fourth-place finish in the long jump, just missing the podium. Buckingham’s best leap was 5.17m, 0.6 behind third place.